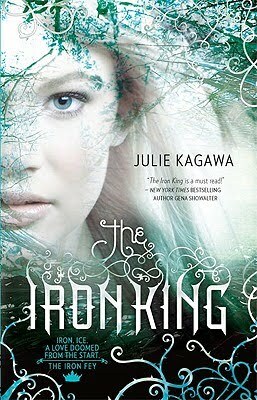 The Iron King by Julie Kagawa. Grades 7 and up. Harlequin Teen, 2010. Reviewed from purchased copy. Meghan Chase is just a normal, somewhat forgettable girl living in the Louisiana countryside until she comes home one day to discover that her four-year-old brother has been replaced by a Changeling and her best (and only) friend Robbie is actually an ancient faery from the land of Nevernever. With Robbie's help, Meghan journeys into the Nevernever in search of her brother, but what she'll discover there is the secret to her true heritage. Julie Kagawa's imaginative faery creatures, lush descriptions of Nevernever, and solid characters made The Iron King very hard to put down, indeed. She builds the tension perfectly at the beginning of the book and I was immediately engrossed by the strange things that were happening to Meghan. It was creepy and definitely made me want to know more. The book's a perfect blend of descriptive fantasy setting and romance and Ms. Kagawa certainly knows how to create characters to pine for. There's adventure, humor, and a bad boy love interest that'll get your blood pumping. While Meghan seems to need a lot of rescuing at the beginning, as she continues her quest to rescue her brother she starts to come into some power of her own. This'll certainly please fans of supernatural romance and I'd try it on fans of Melissa Marr's Wicked Lovely. And I have to say that I looove the cover. It's eye-catching and beautiful and you can't tell this from the picture, but on the actual book the thorny vines and title are raised up, which is a really nice effect. And I just have to add that I booktalked this title at our staff book chat and our Reference manager, who wanted no part of paranormal romance, not only picked it up, but couldn't put it down. The Iron King is on shelves now! The sequel, The Iron Daughter, is slated for release in August, so I'll definitely be looking for that one!